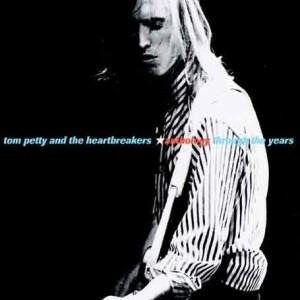 More than a few times over the years, I’ve attempted to compile the definitive road-tape collection of the best of Tom Petty and the Heartbreakers. It’s not easy. In fact, each time I’ve tried, it’s been a hideous undertaking, log-jammed with endless questions like these: “Do you go with the amazing acoustic-intro live version of ‘The Waiting’ or the walk-away-perfection of the original?” “Is ‘Stop Draggin’ My Heart Around” a true Heartbreakers track?” “How about including covers like ‘Something In The Air’ or ‘Psychotic Reaction’ for flavor?” “What about the live B-side version of ‘Change Of Heart? '” “And why not throw ‘Peace In L.A.’ on there?” Arguments like these can eat up days on end…. ’til the point arrives when you just pack up all the albums and drive. See, when the bounty you have to choose from is the work of the greatest and most consistent American band of the last twenty-five years, any Heartbreakers collection is gloriously controversial. Trends come and go, bands of the moment break up, re-form and break up again….and through it all, every year or so, the Heartbreakers unleash a new album full of fire, raw truths, aching melancholy and flat-out jubilation. Any Heartbreakers “best of” is destined to be a great ride filled with road signs leading to the albums that each of the tracks came from. Each album matters. And for every track on this anthology, there’s a “No Second Thoughts” from You’re Gonna Get It, “Mary’s New Car” from Southern Accents, or “Keepin’ Me Alive” from the stellar box set Playback. So, daunting tasks aside, let’s now celebrate the killer flow of this line-up. From “Breakdown,” through the wrenching beauty of “Straight Into Darkness” to the brand new recording of “Surrender,” the song Petty wrote in 1977 and didn’t get around to recording until 2000, this new collection throws a white-hot spotlight on the truth of Tom Petty and the Heartbreakers. From their beginnings in Florida, through their journey out west and beyond, this is a band of fans. And by the way, this is one of the very few seminal bands that has actually performed the impossible–they stayed together. So here is a living mix tape, a portrait of a band still growing. These carefully chosen songs, classics and hidden-classics alike, are constant reminders of the way Tom Petty and the Heartbreakers can make you feel, on any given afternoon, when you’re craving something real, and one of these songs hits the radio. You can’t beat it. You can barely contain it on a couple discs. All you can do is crank it up, and take the ride. Only one question. Is it too late to consider including the live version of “Time To Move On” from Saturday Night Live? And “You Don’t Know How It Feels?” And then there’s always…wait… see, this is how it all starts to unravel. Best to leave this to the professionals.